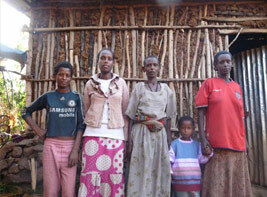 Ethiopia Hope 2013 Updates - A small world but I wouldn't want to paint it! A small world but I wouldn’t want to paint it! Scattered around are several brick houses built by a Maltese project. Some of these are owned by people we know. The houses are bare grey brick inside and look a whole lot better with a coat of paint. We decided on three houses that we would paint, two from money from the project, Nigaste’s one of the teachers at the Day Care Centre who is extremely hard working and helps many people before thinking of herself and Hanok who is a young man, an orphan supported by the Sisters who could rent out one of the rooms in his house thus receiving an income. The third was paid for by us as a personal gift to a family we have supported over the years. Due to lack of time Mike only managed to get one house painted with the help of a couple of local boys. Mike delivered the paint to the other two houses. As he was leaving the school with three tins of 2.5 litres of paint one of the Day Care children insisted on carrying one of the tins. Maskerem is about 6 years old, HIV positive and the day was warming up to around the high 30C. The distant to travel was about a mile. Maskerem grabbed the tin and did not stop once, not to catch her breath or rest her hands. When something is heavy we tend to break out into a slow trot which Maskerem did for the whole mile. Mike was amazed at the strength of this girl and for her reward, all she wanted was a balloon!